2014 Favorites — Beauty, Tea, Books, People, and MORE! January 12, 2015 January 12, 2015 Categories Uncategorized2014 Favorites, Favorites, Favorites of 2014, New Year, Year15 Comments on 2014 Favorites — Beauty, Tea, Books, People, and MORE! I think certain products mark milestones in a girl’s life. For example, at eighteen I tried foundation for the first time and found out what eye primer was. I was both mind blown and utterly confused. For this very reason, (and also, if I ever wonder how long I’ve been devoted to something, I now have recorded proof) here are my 2014 favorites. Beauty, hair, and skin care, but I couldn’t possibly stop there. 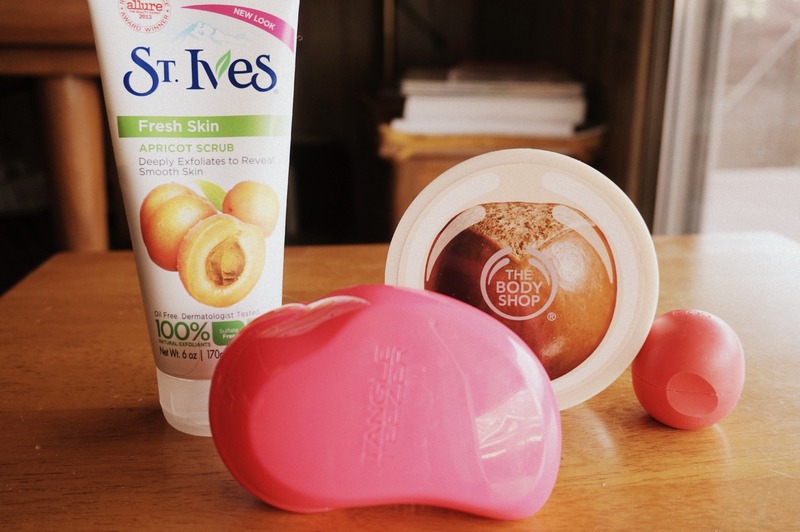 Towards the middle of the year, I started having a few more pimples than I’d like, so I bought the St. Ives exfoliating apricot face wash. I wanted something that was for sensitive skin but could still give that little extra oomph cleaning that I felt my makeup remover wasn’t doing. And the bottle said that it was voted number one in Allure magazine. That had to count for something. Every other day, I use this then apply lotion to my face and I really feel like it’s helped. They’re a reasonable price too. Secondly, I’ve jumped on the Body Shop Body Butter bandwagon. (Wow. A lot of B’s.) Since I’m constantly washing my hands, or dishes, or sticking my hands under blistering hot water, I needed a good lotion that wouldn’t sting on application because my hands were so dry. I smelled a mini one of these and verbally mmm-ed. If a product gives you that reaction, you must buy. The fact that I now have baby soft woman hands again is another plus. I tried EOS this year. Yes, another bandwagon. I had one person tell me those actually dried out their lips. But that definitely isn’t the case with me. I gotta try them all! Finally, my most favorite favorites in this category is my Tangle Teaser. I have long hair. I’m constantly looking for the next-best-thing in the brush kingdom. This – I believe – is it. It hardly ever hurts. Only on those teeny angry little knots that hide until you’re in a big hurry and start dashing a comb through your hair. It doesn’t rip my hair. And it detangles quicker than any other brush. It was also missmarked for $5 when it should’ve been $12, however Target honored the mistake and I got mine for 50% off. Hooyah. This year, I really got into tea. I mean, really got into tea. 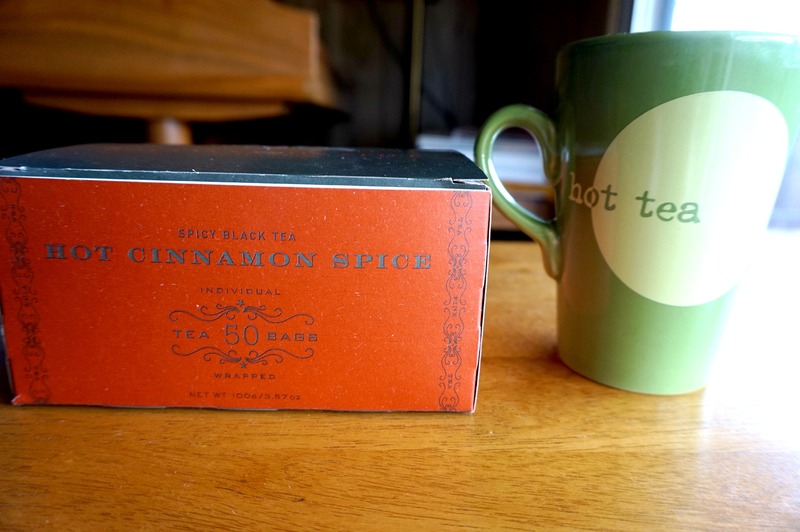 What started it all was Harney & Sons Hot Cinnamon Spice Tea. I bought it off Amazon without putting a lot of thought into it and yes, I bought 50 tea bags of a tea I had never tried before. At that point, let’s be honest, I had to figure out ways of liking this tea or I would parish in my own incompetence. Black, this tea tastes like a Hot Tamale candy. I don’t like spicy cinnamon. In my head, I was thinking sweet snicker-doodle cinnamon. After about fifteen tea bags, I finally achieved the perfect blend. Sugar on the bottom, tea bag, hot water, stew, splash of milk, and deliciousness. To go with my tea obsession has been the growing collection of mugs. I have so many cute ones, but I had to be honest about my favorites, and the one I have used more than them all has been my simple green mug with “hot tea” printed on the side. I love how hefty this mug is. It’s thick, so it doesn’t feel flimsy. It’s a hard-working mug. I also totally poured out the cold chamomile left in the mug and gave it a quick wipe down before taking the photo. That’s how much I use it. “Techy” is a short word for “technological” in case you didn’t know. I am aware it looks like tee-chee. But it’s not that. You’re probably confused as to why my recently purchased camera isn’t under this category. Well, it’s gotten so much love lately. You guys know I’ve bought it. So I thought my old cannon deserved a proper farewell. It did travel with me across the country. It’s been old, trusty, and good to me. I’m sad to say goodbye. In March, I bought my first smart phone in DC. I was so happy, because for more than half the trip I was using my mom’s dinosaur Blackberry. I had an LG phone that broke. But when the Blackberry died that time we were at the Air and Space museum, and I was left to wandering like a lost child, looking for my mother, I was beyond broken up with the cursed little gadget. I was forced to watch the Wright Brother video two and a half times in hopes that my mom would return to the place she left me, and I basically had a miserable day. Anyways, I love my Samsung S4. And for the first time I knew what it felt like to buy a fancy phone, just for the new one to be released right after. Rude. My favorite notebook of 2014 is a blue floral, magnetic-clasp hard back. I’ve written dozens of story ideas, observations, people watching notes, and character sketches in that little guy, and it’s done me well. My favorite book of 2014 was hands-down “We Were Liars.” I love reading books that make you feel something. When I was done with this book, I 100% needed to take a moment and think about life. I was at church and my choir director asked me if I was feeling okay. I gave him a smile and said, “yes.” I was just thinking about life. Music of 2014 was hard to figure out, but I think I would have to say my favorite was Mumford and Sons Babel album. My friend gave me a copy for my birthday, and I’ve never heard anything like them. I love funky stuff like that, and hearing the songs take me back in that dramatic I’m-having-a-flashback-and-everything-is-black-and-white way. Picking a movie is stinkin’ hard. I love movies. I also watch too many in a year to keep track of them. Divergent I saw three times in the movie theater. So that one was good. Mockingjay. .Ohh. Need I say more? And I loved the twist of Maleficent. I just recently began to outreach with other bloggers. I honestly was that stupid person thinking I was the only one out there. Just from December to now I have found so many awesome bloggers that they frankly distract me from writing on my own site, they’re so fun to read about. I know dubbing any blog I just encountered as my 2014 favorite is quite an honor, but let’s just say this is my January month favorite too, and that would have to be Permanent Procrastination. The writer is Tegan, she’s from Australia (which I think is freaking cool that someone from Australia knows who I am, just saying), and she claims to frequent/stalk my blog. A blog stalker, what’s not to like? 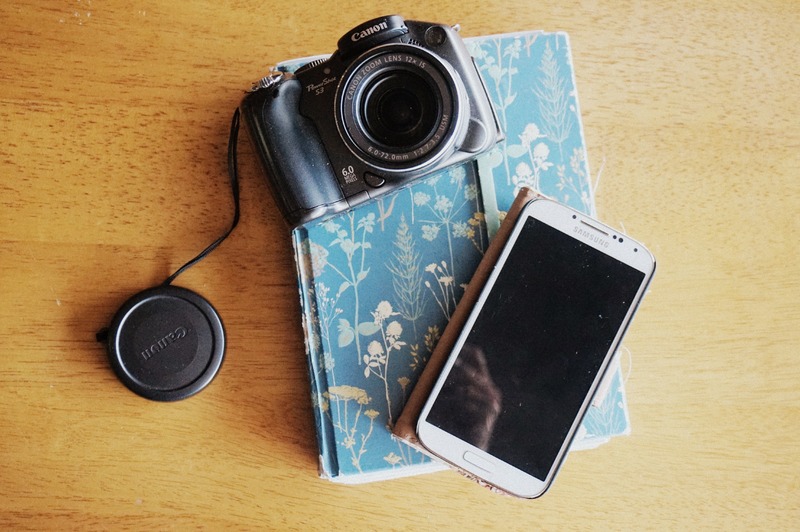 I love her blog layout and photography. I was drawn in first by cute gingerbread men and thinking that her level of neat design, clean pictures, and pretty layout is something I want for my blog. You can imagine my flattery followed by utter confusion when she told me she stalks my blog. My favorite person of 2014, of course, is God, without whom none of this would happen. I’m so grateful for my blog, and for writing, and for the people who support me, from my followers to my family and Chris. Every day, I acknowledge that there is someone greater at work in my life, and I pray that every day I never forget that. May God get the glory in everything I do. Because, honestly, how can I do anything without Him? Thanks for reading! I’m ready to hear from you now. What were your favorites of 2014? Let me know in the comments or message me on any of my social media. I need the brush haha My hair is soo long and thick, it’s so hard to detangle everything sometimes, and it takes a lot of time and patience. Yours seem like a very great product, def gonna try it! You’re very welcome! I hope it works out for you! Lol yeah. I’m trying to make my posts neater! Lol. And you’re welcome =-) Thanks for being so encouraging! Nice favorites! I really enjoyed watching Divergent, Mockingjay, and Maleficient this year as well (along with Captain America: TWS). “We Were Liars” has caught my eye a few times, but I haven’t been able to get my hands on a copy yet. I really need to try the tangle teaser! We Were Liars has been all over Booktube. What’s booktube? So you’ve read it? Because it is A-MAZING!